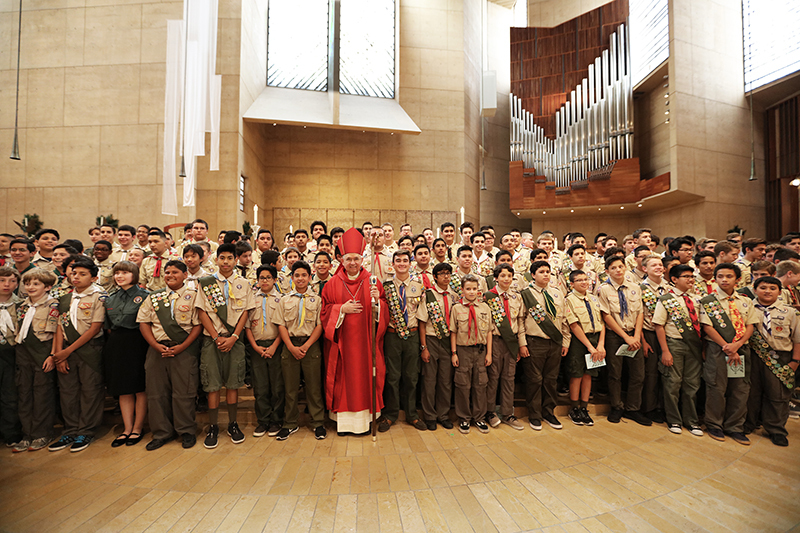 A flood of brown and olive green filled the Cathedral of Our Lady of Angels on May 15, as more than 100 Boy and Girl Scouts and scoutmasters in full uniform attended the 90th annual Religious Emblem Presentation Mass. Celebrated by Archbishop José H. Gomez, the Mass featured participating scouts as lectors, altar servers, gift bearers and more, and culminated in the presentation of medals — blessed by the archbishop — to scouts who earned the prestigious Ad Altare Dei and Pope Pius XII emblems. Both programs require a minimum of 20 to 40 hours or more of service within the community. For scouts like high-schooler Nick Burt, who served as a lector during the Mass, the pursuit of both emblems has been immensely valuable to his growth as a young Catholic developing his faith. “I have to admit, earning these awards brought me many new opportunities: volunteering as well as exploring my faith,” says Burt. For scoutmasters like Nick’s father, Tim Burt, chair of the Catholic Committee on Scouting for the Archdiocese of Los Angeles, and Thelma Reeves, leading the scouts on their service trips and in their discussions about current issues facing the Church and society has been just as rewarding. “We’re teaching the sacraments, but also we’re teaching service,” explains the senior Burt. “They also have the opportunity to share their faith, and that’s an opportunity that a lot of young students in school don’t have,” adds Reeves, who was first drawn to scouting more than 20 years ago by the passion her two sons displayed for the Eagle Scouts. The Religious Emblem Presentation Mass was initiated in 1926 by Msgr. James Dolan. For Nick Burt, being able to share this Mass with his peers from the Los Angeles scouting community is a highlight of his year.